The Mythical Greek Hydra was a serpentine water beast that had multiple heads, the guardian of the underworld the Hydra was a formidable foe and deadly in multiple ways. 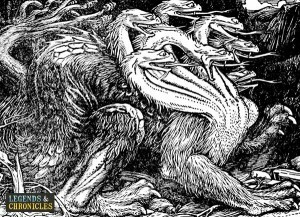 Not only could the Hydra strike with many of its heads, each snake like head contained sharp teeth, and poisonous breath deadly to humans. Worse still, were you to try and defend yourself against the Hydra, with a sword or similar edged weapon, if you cut off one of the Hydras many head, two would grow back in its place. Sometimes refereed to as the Lernaean Hydra, guardian of the underworld at the Amymone spring, where the beast resided. The spring itself was a deep cave which gave the Hydra the protection it needed when resting, and it typically only ventured out in nearby towns and villages when it needed to feed, usually on local villagers and townsfolk. The Hydra struck fear into the hearts of the local residents, the stories and myths were of legend. The defining feature of the Hydra was of course its multiple serpentine, snake like heads, with sharp curved teeth the Hydra would be able to deliver poison fast enough to render a man immovable in minutes. The body of the hydra itself was again snake like, and the Hydra was said to leave trails that were poisonous too, so avoiding the path of the beast was paramount. Finally the overall size of the Hydra was large compared to an average snake, but not as big as might be expected, the height of a Hydra in its body was less than a man, but with the multiple heads the Hydra could stand tall. The Hydra lived in a discreetly hidden cave at Amymone Spring situated at Lerna which was considered one of the entrances to the Underworld, and was located in southern Argolis in Greece. Hera the sister of Zeus raised the Hydra specifically with the intention of killing her own brother Hercales. Hercales possessed incredible strength, cleverness and heart and was a formidable foe for anyone, but Hera was certain the Hydra would prove to be his downfall. Hercales with his passion for freedom and to make the world safe, heard of the Lernaean Hydra and how it was terrorising the towns folk of Lerna and decided it was necessary to rid the world of this menace. Hercales would travel to Lerna with his nephew Iolaus to help him kill the Hydra. Drawing the Hydra out from the cave using flaming arrows, Hercales engaged the Hydra when it came into melee distance. With each of the head of the Hydra growing back double after Hercales sliced them off, it was Iolaus who helped Hercales to seal the necks of the Hydra using a torch to stop them from growing back. 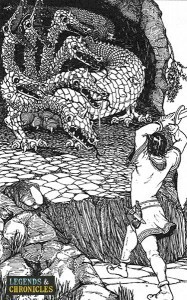 When Hercales finally overpowered the Hydra and sliced off its final head, he buried the head under a mighty rock to ensure the Hydra would forever be beaten. Thus the Hydra met it’s end at the hands of Hercales and Hera plan was foiled.